A couple years ago, it was pretty difficult to find a role that didn’t require you to be in the office every day. But today, companies are realizing the value of remote employees—and the number of available remote & telecommute jobs is increasing every day. To help you find the perfect one, we’ve created an overview of remote job boards, as well as the companies who hire remote employees. Hubstaff Talent is a remote job directory we created with the aim of connecting the best freelancers and agencies in the world with the most interesting businesses looking for help. In order to do that, we decided to make the service 100% free, so no matter whether you’re looking to fill an opening or find work, there are no fees. 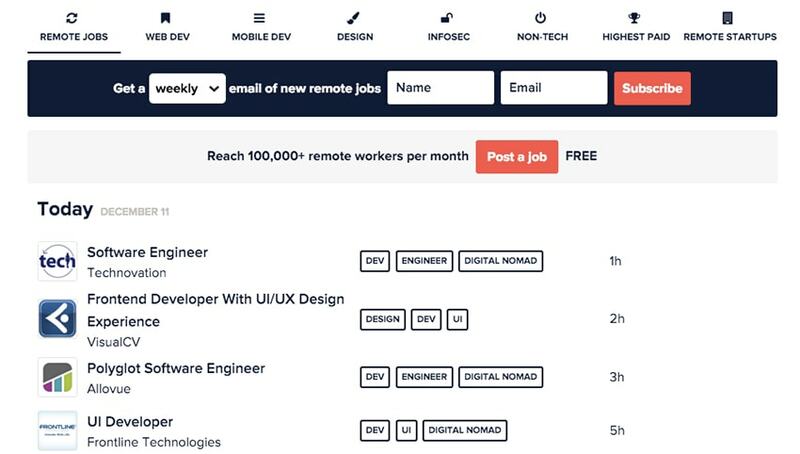 Remote OK acts like a search engine for all the remote jobs out there. You can look through the web development, mobile development, design, information sector, and non-technical categories—or you can enter a search term, like “node js” or “sales” and see what comes up. We’d also suggest browsing through the list of highest-paying jobs, which could come in handy when negotiating salary or rates. Remotive.io has a curated list of opportunities from its partner companies. All of the companies are remote startups, and most of them are also in tech—which means the majority of the jobs on Remotive are in engineering. We Work Remotely is another remote jobs aggregator. There are plenty of programming and devops positions, but the site is a little light on other roles. Bitwage aggregates remote job opportunities posted by companies and users on places like Twitter and Reddit. About half a dozen new opportunities are posted every hour, so this is one you’ll want to check frequently. Arctic Startup is a niche jobs board for European startups. It lists full-time, part-time, remote, and traditional roles, so make sure you adjust your preferences accordingly. Jobspresso is another remote jobs board. The quality of work is usually a little higher because each position is carefully reviewed before being added to the site. And if you want companies coming to you, rather than the other way around, Jobspresso also offers the option to upload your resume. Recruiters and employers search this database for relevant keywords, job titles, skills, experiences, and so forth. Skip the Drive has thousands of telecommuting job opportunities. Not only will you appreciate how many options there are, you’ll also find the filters super handy. You can filter jobs by keyword, how recently they were posted, commitment level, and company. AngelList has a collection of the jobs on its site that employers have tagged “remote OK.” There are opportunities for professionals in marketing, data science, product management, operations, sales, design, and engineering. You can further choose between roles that are “full-time,” “part-time,” “contract,” or “internship.” And if you want to know when new jobs are added to the collection, you can subscribe to a weekly email. Most of the jobs on The Muse require you to live in a specific city, but the site also has a fairly robust “flexible/remote” section. Unlike other jobs boards, The Muse provides a full profile for each company. The insights you’ll glean from the pictures, videos, and text are helpful when it comes to figuring out which culture will suit you best. You might be craving a vacation, but can’t afford (or don’t want) to stop working. You need a Jobbatical. On this site, you’ll find 11 and 12-month jobs in exotic locales, including Hong Kong, Greece, Malaysia, and Spain. From community management and sales to design and marketing, every type of professional can find something. Side Projectors gives you the chance to turn your passion project into money. It’s a marketplace for side projects: You submit your finished website, mobile application, desktop program, or hardware product, set a minimum price, and wait for interested buyers to contact you. Are you a woman in tech? Power to Fly connects female developers with remote jobs. It’s a fairly lengthy process—you need to complete an application, go through a screening process, and complete a 2-4 week trial period with each company before you can officially start. GitHub has become the unofficial resume for developers, so it’s not surprising the site has started listing jobs. Most of the companies are tech startups—if that’s not your niche, we’d advise browsing through a different platform. Although Workatho.me bills itself as a remote jobs board for technical professionals, the majority of open roles are in software development. There’s also a category called “Jobs for Moms”—be sure to check it out if that describes you. Stack Overflow isn’t explicitly for remote jobs. To only see the applicable jobs, just choose the “Allows remote” filter. Last time I checked, there were 310 matching positions—and many of them had been posted mere hours ago. 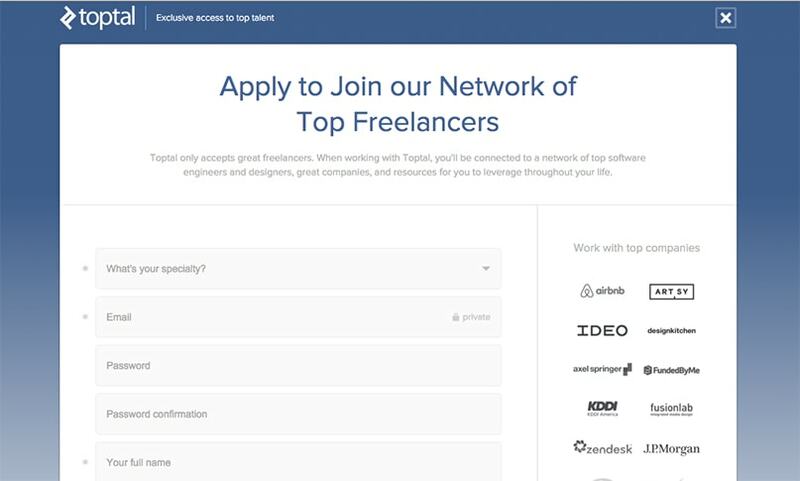 Thousands of designers and developers apply to be Toptal freelancers each month, but only 3% are accepted. If you can make it past the highly selective application process, you’ll (literally) be in business. Toptal matches you with challenging, top-tier projects at well-known companies like Airbnb, Zendesk, J.P. Morgan, and IDEO. You probably already use Dribbble to showcase your work, so why not use it to find a job? Just make sure that you check the “Remote/anywhere” box under Location. This doesn’t leave a huge number of jobs, but you should still be able to find some good options. Most of the jobs on Behance are location-specific. There are a couple that indicate you can work from anywhere, but unfortunately, the site doesn’t offer a quick and easy way to find them. Virtual Vocations always has several pages of marketing positions that can be done remotely. You can even browse through jobs based on their “travel requirements”—pretty helpful, as many remote sales and marketing jobs require some travel. Inbound.org is an online community for 140,000 marketers (and counting). It’s also a great resource for remote marketing jobs. Pro tip: If you decide to apply for a job, you’ll be directed to the organization’s “Careers” portal. Make sure you mention that you applied through inbound.org, as this will give you instant credibility. If you’re passionate about marketing, you’re probably familiar with Growth Hackers. In addition to case studies and articles, this site also posts open marketing positions. Most of them are on-site, but you’ll find a couple remote jobs. When you’re tired of working in a corporate environment, turn to Escape the City. The creators’ goal is to help people find opportunities with progressive companies they could really believe in. To that end, you can search job listings by “Escape Factors:” do you want to work for a company that’s entrepreneurial, exciting, exotic, socially impactful, or some combination of those? There isn’t a huge number of remote jobs (we only found eight last time we checked), but that’s probably because there aren’t a huge number of organizations that meet Escape the City’s criteria. CloudPeeps is a fantastic platform for PR reps, growth hackers, and marketers looking for freelance projects. While the application process is fairly competitive, this has helped attract well-known companies to become customers. Idealist connects job-seekers with non-profit organizations. There are usually a couple hundred remote work listings, and they run the gamut from advocacy and fundraising to activism and writing. Want to apply directly to a company? All of the businesses on this list hire remote team members—and some of them only hire remote team members. Once you find a position that interests you, check out the interview questions a hiring manager might ask and what they’re looking for. You can also learn about 5 Steps to Becoming a Better Remote Employee—From an Employer’s Perspective. If we missed any remote job boards, please let us know in the comments below. Good luck in finding the perfect remote position!